Gain: 0.25dB step size, 86dB range. The clocks are managed by the device and are software programmable. Please refer to the device data sheet for the various clocks within the device. The board provides a 40MHz crystal for the AD9361. The SPI signals are directly passed to the HSMC connector. The device allows real-time control via dedicated pins. These signals are passed to the HSMC connector. The functionality of these pins are programmable and includes gain, synchronization, state machine control etc. Please refer to the data sheet for more details. The device also allows real-time monitoring of internal signals via another set of dedicated pins. Again, these signals are passed to the HSMC connector. The internal signals are multiplexed into these pins- and details of which are best described in the data sheet. 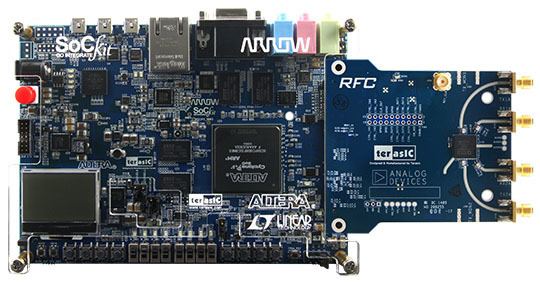 The board receives all the power from the FPGA board through HSMC.